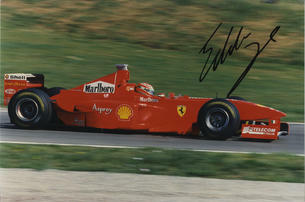 This is an In Person Signed Colour 12" x 8" Photo of the former Irish Formula 1 Driver pictured in the Ferrari. Edmund "Eddie" Irvine, Jr. (born 10 November 1965, Newtownards, County Down) is a former racing driver from Northern Ireland. He grew up in Conlig, County Down, and was influenced by his parents, who were also involved in motor racing. His father, Edmund Sr., and his sister, Sonia (now a physiotherapist), worked with him during his career. His professional racing career began in 1983 and he progressed to Formula Three racing in 1988, before moving on to Formula 3000 in 1989. He got his break in the top of the Formula racing series after he started racing for Jordan in the Formula 3000 series in 1990, and was subsequently picked up by the Jordan Formula One team in 1993. His reputation steadily increased in Formula One, eventually leading Ferrari to sign him to partner Michael Schumacher in 1996. 1999 was his most successful season; Irvine won four races, taking the Drivers' Championship to the last race in which he finished third. In the overall Championship he finished as runner-up to McLaren driver Mika Hakkinen. He left Ferrari the following year for the new Jaguar Racing team and was the only driver to get Jaguar to the podium in their short F1 history; he achieved this feat twice.